Nick advises me on all matters realting to my mortgage, pensions & investments. Nick recently advised me with regard to reviewing my mortgage. The great thing was, that I did not have to spend hours trawling the internet, trying to find the best deals for myself, because Nick did that for me. The whole deal was sorted out within days & I am saving money every month. Despite the fact that mortgages are not always easy to come by these days, Nick sorted out the best deal for me. Nick’s knowledge of the financial market is second to none & he always has his customer’s best ineterests at heart. Nick offers an extremely prompt & professional service, whilst remaining a very friendly & helpful personality. 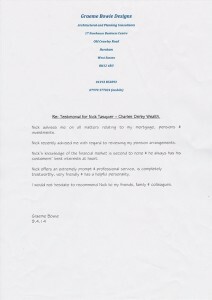 I would not hesitate in recommending Nick to my friends, family & colleagues.